While the Longhorned tick has not been linked to any human infection in the US, the N.C. Division of Public Health is working with NCDA&CS to understand its distribution and monitor for diseases it may carry. The finding of this tick in the state corresponds with an effort by the N.C. Department of Public Health to identify ticks in all 100 counties of the state. 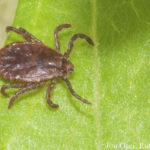 Veterinarians are asked to submit ticks they find on clinical patients to help track and identify tick populations in North Carolina. If you are a veterinarian practicing in North Carolinaand are interested in participating in this study, email Dr. Alexis M. Barbarin at NCTickID@dhhs.nc.gov.